Everything in this world has gone slimmer and sleeker. Whether it’s the hot heroine that you see or the mobile phone screens you see your heroines on. Technology is all about sleekness. 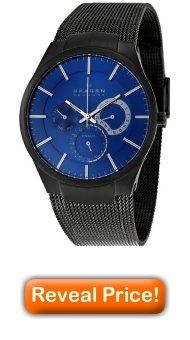 Skagen 809XLTBN Titanium Blue Dial Watch offers you the best in accuracy and style. The Skagen brand takes its name from the fishing village of Skagen, Denmark. In keeping with a European design aesthetic, Skagen watches for men and women are sleek, elegant, and modest timepieces boasting quiet precision. Titanium case with a black ion plated stainless steel bracelet speaks of the contemporary appearance. Blue colored dial shines like a sapphire embellished in a king’s crown. So don’t hesitate to conquer the world in royal feel that this watch offers. Accuracy, hassle free operation and long life is what quartz movement gives. Quartz movement is much more accurate than mechanical one. That’s because the oscillator of a quartz watch, the little piece of quartz, is a much steadier oscillator than the balance wheel of a mechanical watch. Another advantage of a quartz watch is that, unlike a mechanical watch, which has a mainspring, quartz watch needs no winding. “Bleed blue!” seems to be the design concept as the blue color of dial rules the watch. Glossy luminous silver colored hands and hour markings are prominent on blue base. Titanium case with a black ion plated stainless steel bracelet gives it all the strength that it needs. This Skagen mens watch has a fixed bezel and three sub-dials displaying: 24 hours (GMT), day of the week, and date sub-dials serves the proper functionality. Red colored Sunday marking can keep you going for the whole week to work harder throughout and aim all the that you will have on your off. Scratch resistant mineral crystal can protect the beauty that you will own. Mineral crystals are also better at shatter resistance compared with sapphire. Not only this but this timepiece offers water resistant at 30 meters/ 100 feet. Stainless steel watch bracelets are highly durable and wear well in all kinds of weather. However, they are generally heavier than leathers or textiles but suits almost all the skin types. The mesh pattern looks uber cool complements the whole sleek look of the watch. Sleek, light weight, blue dial, water resistance, luminosity, modern hour marking and hands wins this watch all the brownie points, although you may miss sapphire crystal but at this price? – It’s a steal.